[*] The title of the post made on purpose. As we know, the key denial assertions are the scheme 'six/plan/gas': that the murder of approximately six million Jews during World War II never occurred, that the Nazis had no official policy or intention to exterminate the Jews, and that the poison gas chambers in Auschwitz-Birkenau death camp never existed. So, now, January 2017, the 'historian-archives' guy, the fake 'closest to academia' thing guy, and the 'technical' guy, maybe not all of them on every single subject, but more or less all three admit there was planned genocide in mass numbers, especially the Reinhard camps (Treblinka, Belzec, and Sobibor), the Ostland liquidations and the Einsatzgruppen killings. After all, the Holocaust was not only Auschwitz. David Cole even wrote an article 'Denial is dead'. - David Irving now confirms gas chambers at Auschwitz. "How were they killed, and where? On a small scale, unwanted Jews were put to death by gassing in two small units at Auschwitz, the White House and the Red House, which is now in Poland. It was a death camp as well as a slave-labour camp. A Polish court in 1947 found that its German officers, who were mostly hanged, were guilty of running a camp in which "up to 300,000 people" of all nationalities had died from all causes." - No informed person disputes that Europe's Jews did, in fact, suffer a great catastrophe during the Second World War. Millions were forced from their homes and deported to brutal internment in crowded ghettos and camps. Jewish communities across Central and Eastern Europe, large and small, were wiped out. Millions lost their lives. When the war ended in 1945, most of the Jews of Germany, Poland, the Netherlands and others countries were gone. Given all this, it should not be surprising that even well-founded revisionist arguments are often dismissed as heartless quibbling. The competent revisionists, David Irving, Mark Weber, and I, recognize two distinct killing periods during the Holocaust: The Einsatzgruppen murders after the invasion of Russia (’41), and the murders (both in the General Government and the Ostland) during the Reinhardt period (’42 - ’43). The three of us have not 'conspired' to come to this conclusion. I have neither seen nor been in contact with David Irving since 1995. The acceptance of the reality of these two killing periods happens organically when one chooses to look at the evidence in an objective manner. David Irving is no longer a denier, if he ever was one. He accepts the fact that Jews were slaughtered en masse by mobile Einsatzgruppen units in the months following the invasion of Russia, he accepts the liquidation of the Jews in the Ostland (Eastern territory) ghettos, and he accepts that the 'Reinhard' camps (Treblinka, Belzec, and Sobibor) were extermination centers. Mark Weber, whose Institute for Historical Review defined Holocaust revisionism (and denial) in the 1990s, believes the same. And me? The 'Jewish revisionist'? I never denied the Reinhard camps, the Ostland liquidations, or the Einsatzgruppen killings, and as early as 1995 I chided my fellow revisionists for rejecting the notion of a Nazi extermination program. Sure, there are still deniers posting YouTube videos and calling them 'documentaries,' most notably the (in the words of his own attorney) 'mentally ill' Eric Hunt, but the only thing these cranks are capable of doing is recycling my 25-year-old work regarding Auschwitz and falsely labeling it denial. The response of the deniers community? 'Jewish plot', 'white flag of surrender to the Zionists and propagandists who plague us', 'Irving is neurotic and senile', 'stabbing revisionists in the back because of some big pot of gold waiting somewhere if he makes enough brownie points with the Jews', and even nasty ugly statements like 'They are [not] normal heterosexual family men and can be blackmailed'. LOL, still Cole has trouble spitting out "gas chambers" when he writes about the Einsatz Reinhard camps and the lunacy of denier claims for resettlement (aside from that little niggle, Cole writes quite well actually about this subject). They still have Il Re di Convoluzione, although the bulk of his readership may - thankfully - be the Holocaust Controversies crew, who continue to excoriate Mattogno and his diminishing posse. I agree with Cole that it cannot be good for "revisionism" that Hunt represents its future. Another point supporting your post: Jansson and Kues both now MIA and apparently gone from the scene. Also, Incoherent History has lapsed into recycle and revive mode. Our deniers here do not like this topic, references to gas/plan/six, btw. These references make them get all defensive and huffy. I've always enjoyed David Cole, he has a nasty sense of humor and enjoys rubbing it in other people's faces. He wrote an essay about Jews sent to "Unicornville." He concluded it by reminding everyone not to assault old Holocaust survivors and dedicating that to Eric Hunt. David Cole is one of those individuals who craves attention and will take controversial views to get it. Michael Shermer in his book "Denying History" wrote about a time that Cole took a black date to a meeting of white nationalists just to make everyone uncomfortable. I've never read anything by David Irving. He strikes me as someone who thought HD was going to be the next big thing and jumped aboard, only to get smacked down. He's an old racist/anti-Semite, not to mention a weathervane (I'm a denier, I'm not a denier, it's Wednesday so I'm back to being a denier). At one time his book "Hitler's War" was considered to be a big thing, I've never seen any copies of it anywhere. Irving now tip toes around the subject, probably in hopes of being accepted again. I don't know much about Mark Weber other than the little I've read about him in Shermer's book and on-line. From memory, I think he has a Masters degree in History. According to Shermer (again, this is from memory) he is very intelligent. He is now in it up to his ears from the denier community over what he said. Berg went trolling for information on FG's blog about Weber's mother being Jewish. Berg never disappoints. Weber came to the conclusion that to advance his right-wing political agenda HD was not a good tactic. It speaks volumes that Mary Q for one reuses old, old Weber gambits. Another person who has rejected denial, and who writes well about it, is Christian Lindtner. Agree with Jeffk, nicely observed OP. Thank you both for your comments, always valuable sources. They give me motive to search for more. Statistical Mechanic wrote: Another person who has rejected denial, and who writes well about it, is Christian Lindtner. Christian Lindtner says something about 'the way ancient Greek (and Indian) philosophers looked at the matters'. «[...] have landed me in a different position: We should be grateful that there are still people willing to defend the most absurd positions with great skill. It can be intellectually stimulating! How could we, without them, seek and speak the truth - with a smile? - If I want to prove the correctness of my views, I can and I should find many opposite views and opinions and excerpts (from what has been written by my opponents) and many examples that suggest the opposite (from what I am telling has happened) to convince my audience that I am right, just exactly as my opponent who argues the opposite would do. The only way to convince my interlocutors (and to convince myself) that I am right, is just to doubt, to 'sabotage' my own views, and after that to prove that my views can withstand. I think you're all missing the important point here, which is that if Mark Weber would just do the right thing and legally change his first name to David, then they would collectively be called "the three Davids" and the world would be a much better place. Or maybe David3. Also a pleasing rubric. Quite cube-like. With our David it is 3-D plus little d.
Statistical Mechanic wrote: LOL, still Cole has trouble spitting out "gas chambers" when he writes about the Einsatz Reinhard camps and the lunacy of denier claims for resettlement (aside from that little niggle, Cole writes quite well actually about this subject). Well you seeeee the reason is because they would enter the camp then die out of thin air! Yeah... 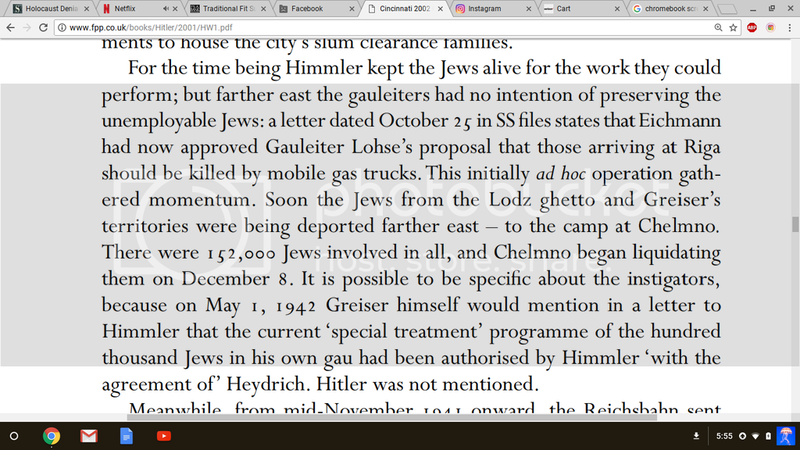 He also denies the existence of gas vans but seems to believe that Chelmno was a death camp as well. David Irving says "small scale gassings at Bunkers I & II" when he talks about Auschwitz-Birkenau. Kleon_I XYZ Contagion wrote: - David Irving now confirms gas chambers at Auschwitz. Irving stole this revision off from Fritjof Meyer's 2002 article on the Auschwitz death toll... An essay which in itself is flawed in heart and souly on mostly honest mistakes. Meyer is not a Historian so don't take his contribution as anything important. If I remember correctly he works for spiegel. As far as the capacity is concerned, 350 000 people could have been gassed alone in the "Red House", or "Bunker II", within two years. Of course Irving, and thus also van Pelt, only examined the cellars of the crematoria, even though the rate of murder sank dramatically with their being brought into service, for the period of one year due to an order by Himmler, who terminated the supposed euthanasia action "14 f 13" and with this, also the gas murders in the extermination camps along the German-Soviet demarcation line of 1939: Belzec, Sobibôr and Treblinka. Last edited by Denying-History on Mon Jan 16, 2017 8:07 pm, edited 1 time in total. Denying-History wrote: Irving stole this revision off from Fritjof Meyer's 2002 article on the Auschwitz death toll... An essay which in itself is flawed in heart and soul on mostly honest mistakes. Yes, I remember we talked about this. Meyer is a favorite among deniers with his revised death toll, when I looked him up he pops up on a bunch of denier sites. Yeah they for some reason adore him... I am not sure why... His estimate is based on a faulty cremation rate and a 9 hour operation time per day for the ovens. Mark Weber, director of the California-based Institute for Historical Review, received a letter from Britain’s Home Office that stated, "You are the subject of an exclusion decision taken personally by the Home Secretary on 28 April 2015 on Unacceptable Behaviour ground," Reuters reported Wednesday. The decision was made by Prime Minister Theresa May while she was still serving as Home Secretary, prior to the 2016 Brexit referendum and the political upheaval that has followed it. The letter to Weber stated May "personally" decided to bar him from entering the country, saying his presence there was viewed as "not conductive to the public good." Weber reportedly discovered he was barred from entering the U.K. while at Madrid's airport en route to London. Weber once wrote "the Holocaust hoax is a religion" and the Southern Poverty Law Center describes him as an individual "who has probably done more than any other American to popularize denial of the World War II Holocaust of European Jews." In 2001, Weber wrote, "Around the world awareness is growing that the ‘Holocaust' campaign is a major weapon in the Jewish-Zionist arsenal, that it is used to justify otherwise unjustifiable Israeli policies, and as a powerful tool for blackmailing enormous sums of money from Americans and Europeans." Weber generated uproar among Holocaust deniers in 2009 when he called the movement a "hindrance" to combatting the true enemy: "Jewish-Zionist power." The U.K. has seen its own spikes in anti-Semitism, with 2016 seeing 1,309 anti-Semitic incidents recorded, a record high. In the past, the U.K. has barred other individuals from the U.S. for their political and ideological perspectives, including five American right-wing radicals in 2008 who were blamed for "fostering extremism and hatred." Is there an explicit admission from Irving that gas chambers were used at AR? I get the feeling that he is avoiding the method of murder there. Even if he waffles on the Holocaust now he’s still a vile antisemite. Sergey_Romanov wrote: Is there an explicit admission from Irving that gas chambers were used at AR? I get the feeling that he is avoiding the method of murder there. Just finished breezing through Hitler's War", Millenial Edition. In it he gives not so much an "explicit admission" as a tacit one. He only mentions Auschwitz 4 or 5 times, Belzec ,Treblinka, Mauthausen, Chelmno (not by name), Majdanek once each. No explicit mention of a "murder weapon" except when discussing shootings. ERA: He does mention gas vans at Chelmno. Could you plz take a photo of the gas vans part and post it here? Could come in handy. He originally made this concession in an interview with the Guardian after he was released from jail in Austria; I think he mainly talked about the death toll and cited the Hoefle telegram as a piece of proof that convinced him. So, like Cole he has pretty much slithered past the GCs issue ever since. Sergey_Romanov wrote: Could you plz take a photo of the gas vans part and post it here? Could come in handy. Always....trying to get that thing he calls a heart to finally burst under the weight of its own evil. That way the universe can finally punch his time clock and he can go have tea time in Hell with Hitler. From what I understand he’s never denied gas vans existed - unlike David Cole. He has only argued they were “experimental”. What supposedly about Chelmno that wasn’t systematic, I’m not sure. 100,000 were killed between December 41 and June 5th 42. To me this is systematic. If Irving is being quoted correctly then this is somewhat consistent with the remark by the Polish gentleman I mentioned who said '200,000 tops'. It should also be noted that Irving doesn't claim exclusively 'Jews in gas chambers' but 'all nationalities from all causes'. I presume that Irving includes diseases, malnutrition, etc. ?? Maybe it also should be noted that the placement of the quotation marks makes it sketchy on what Irving's words actually were. And then the link doesn't direct me to the reference to those words. If somebody knows 'which' link, could they let us know? He did say 300,000 but only as a speculative guess. The source he stole his latest thesis on Auschwitz for said 500,000, which they estimated on faulty methods. Denying-History wrote: He did say 300,000 but only as a speculative guess. . Thanks for your attempt to clarify. If you have something more definitive from Irving then you might want to produce it here. Otherwise that seems to be the best we have on his opinion. Did he say 'speculative guess'? Did I put “speculative guess” in quotations? No. He quoted an old 1945 statement saying 300,000 were registered dead from I believe a polish film. Deniers like to cite it and take it out of context. The exact word from memory he used was “probably”. I didn't suggest you 'said'. Thanks for the clarification, fwiw? You asked if he said”speculative guess” and you were told no. It was never suggested however that you put words in my mouth. It’s just how I represented what he said. In view of every other estimate it’s justified, especially in view of the methods by which he reached it. You're starting to sound like a word salad. Explain what you have to say if you think it's important. Doesn’t really matter...300,000, 200,000...those numbers are wrong. He’s probably going to end up the next bobbo and get blocked by everyone.